We’ve got your conservatory covered with our fantastic selection of contemporary roof and side blinds. 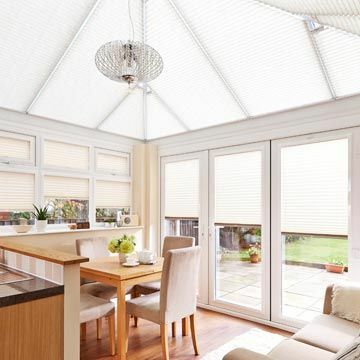 Specialist Pleated blinds for your conservatory can help you to stay cool in summer and warm in winter. Neat, tidy and just … PerfectFit blinds clip into the frame of your uPVC conservatory side windows. Find out more about this smart design. Want to find out more about choosing the right blinds for your conservatory? Visit our tips and advice page. Looking for a more flexible space? 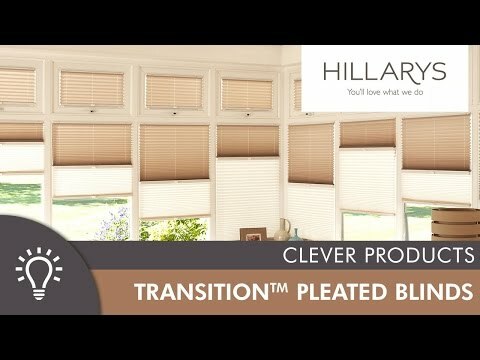 Take a look at the clever design of our Day and Night Transition™ blinds. Top tips for tailoring your window dressings to your space. Whatever the style, size or shape of your conservatory, you’ll find a blind that’s exactly right for you. We’ve got hundreds of beautiful designs and colours to choose from, including innovative features to help you keep your conservatory comfortable all year round. We’ve got reflective fabrics to help you stay cool in the hottest environments and innovative thermal blinds for chilly rooms and cooler months. Our ThermaShade™ Pleated blinds feature honeycomb cells that actively reduce heat loss at your conservatory windows for an extra cosy feel. If you’re overlooked, we have versatile designs that can help you enjoy the sun while maintaining your privacy. And of course we’ve got motorised options to help you control your hard-to-reach roof blinds simply and easily. So whether you’re looking for a blind for a stylish orangery, a spacious conservatory, or even a compact lean-to, we can help you create the perfect space. With so many options to choose from, our specialist advisors are on-hand to talk you through all of the options, so you can make an informed decision on the perfect blinds for your home and lifestyle. And once you’ve made your selections, your advisor will expertly measure your conservatory and fit your blinds for a perfect finish. So book an in-home appointment today and create a comfortable conservatory you’ll love.